Did 6:00 sneak up on you again? 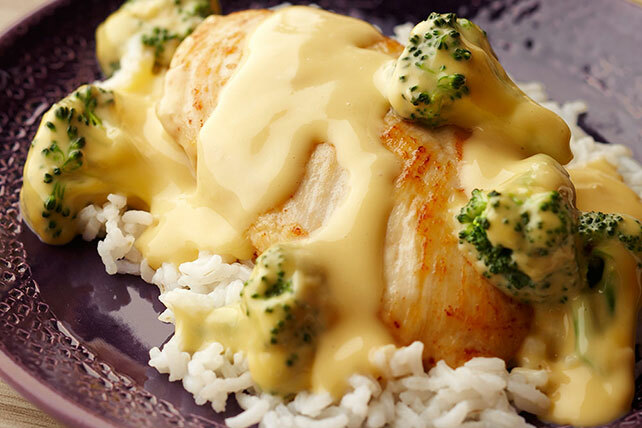 How about cheesy chicken and broccoli over rice in the skillet? It's ready in less than half an hour. Heat oil in large nonstick skillet on medium-high heat. Add chicken; cook 7 min., turning after 4 min. Add broccoli, soup and VELVEETA; mix well. Simmer on medium heat 7 min. or until chicken is cooked through (165ºF). Prepare using your favorite cream soup and frozen vegetable combination, such as mushroom soup and peas. This quick main dish provides 1/2 cup of broccoli per serving and brown rice, for a cheesy, yet low-fat, recipe for any night of the week!